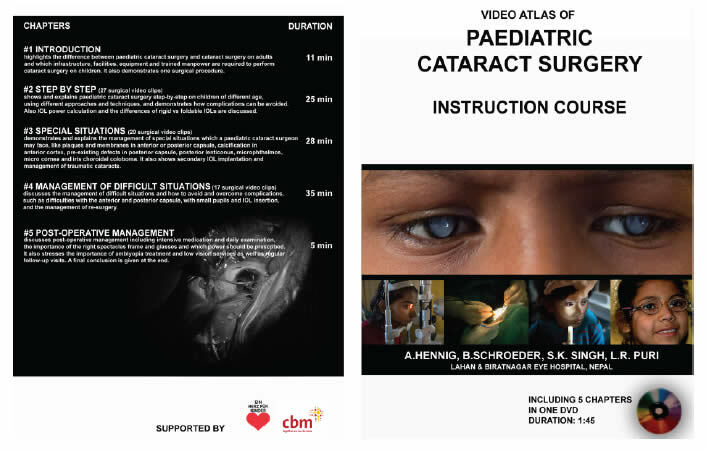 The “Video Atlas of Paediatric Cataract Surgery Instruction Course” is an excellent new DVD on cataract surgery for children from Lahan and Biratnagar Eye Hospital in Nepal. It includes assessment and follow up, and has clips and voice over on how to do uncomplicated cases, how to manage complications and how to operate on eyes with other abnormalities. The DVD is free for ophthalmologists in low and middle-income countries and 25$USD/£15/€20 for ophthalmologists in high income countries. To order a copy, please send your full postal address and give details of the institution you work in, to Anita Shah, International Centre for Eye Health, London School of Hygiene & Tropical Medicine, Anita.Shah@LSHTM.ac.uk.